Several area college students are spending their summers interning at various non-profits throughout the Alleghany Highlands this year. 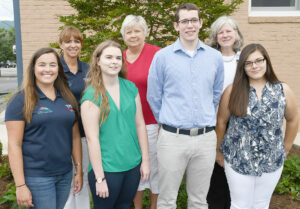 Two are working with The Alleghany Foundation, three are assisting at the Alleghany Historical Society, and one is interning at the Alleghany Highlands Chamber of Commerce and Tourism. 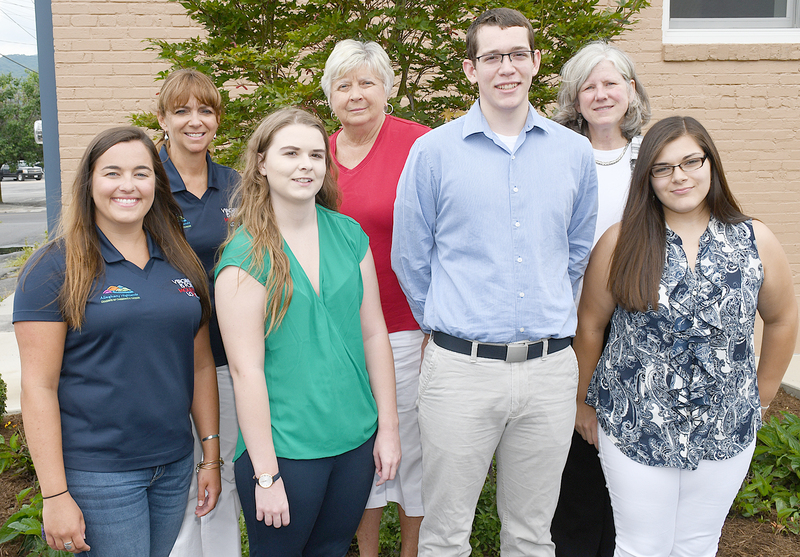 The student interns include Chris McHenry and Brianna Negrete at The Alleghany Foundation, Autumn Woodson, Zoe Wulff and Paul Hanna at the Alleghany Historical Society and Mackenzie Kenny at the Alleghany Highlands Chamber of Commerce and Tourism. Chris McHenry, a member of the Alleghany High School Class of 2017 and the Virginia Tech Pamplin College of Business Class of 2021, is spending his summer at the foundation focusing on how to engage with community members and to encourage them to live more actively. Chris is the son of Dennis and Sandra McHenry of Clifton Forge, and he has lived in Alleghany County for 13 years. At Virginia Tech, he is studying business information technology with a concentration in decision support systems and with a minor in computer science. Also at Tech, Chris is involved in CRU, an on-campus church club formerly called Campus Crusade for Christ International. He also volunteers with the Blacksburg Middle School after-school child watch. Chris enjoys swimming, running and playing with his dog, Morty. Bath County native Brianna Negrete, a rising sophomore at William and Mary, is studying neuroscience and is on a pre-med track toward graduation in 2021. This summer, her scope of work coincides with the Vision 2025 initiative that focuses on community landscaping and destination gardens. Brianna is the daughter of Debora Gibson and Fernando Negrete and the stepdaughter of Donald Gibson. She was the salutatorian for the Class of 2017 at Bath County High School. At William and Mary, she participates in Quiz Bowl. The team travels to nearby college campuses — including the University of North Carolina and Virginia Tech — to compete in collegiate academic trivia competitions. She is also a member of Colleges Against Cancer, an organization that raises funds for cancer research and hosts an annual Relay for Life event in Williamsburg. Autumn Woodson, a senior social science major at Radford University, is conducting interviews to gather information on local industries for the Alleghany Highlands Industrial Heritage Museum. Autumn is the daughter of Melissa Woodson and was the valedictorian for the Class of 2015 at Covington High School. Zoe explained her intern work over the summer. “I am working with the Alleghany Historical Society to collect information and conduct interviews for the Industrial Heritage Museum,” she said. Paul Hanna is a rising junior at James Madison University majoring in public history with a minor in microbiology. A graduate of Covington High School, Paul is the son of Kevin and Dianne Hanna. He has been volunteering one to two days a week at the restored Covington C&O Depot and has participated in some of the intern activities. Dr. Linkenhoker said he appreciated the efforts of all his interns this summer. “The opportunity to have college interns and volunteers working on society projects this summer is exciting and extremely beneficial to our mission of historic preservation,” he said. “The interviews being conducted with individuals who have first-hand knowledge of our industrial heritage are priceless. We are also fortunate that the media skills of these young people will allow us to capture, preserve and present these interviews in a variety of video, audio and print options. Mackenzie Kenny is spending her summer as an intern at the Alleghany Highlands Chamber of Commerce and Tourism. A lifelong resident of Clifton Forge, Mackenzie is the daughter of Ed and Jean Kenny. A 2014 graduate of Alleghany High School, Mackenzie will earn a bachelor’s of business administration degree in marketing from Radford University in May 2019. Mackenzie has devoted much of her summer to promoting the Alleghany Highlands as a tourist destination. Alleghany Highlands Chamber of Commerce and Tourism Executive Director Teresa Hammond said she has enjoyed having Mackenzie on staff this summer. “She assisted with several special projects and with the outdoor events, including the Jackson River Scenic Trail Marathon, Half Marathon, 10K and 5K, as well as the Alleghany Gran Fondo,” Hammond said. “Mackenzie learned about how we are trying to strengthen and grow our tourism industry here in the Alleghany Highlands. “Having a college student from the area working in our office also gave us a renewed perspective on why we focus our energies on tourism and educating the visitors on all that the Alleghany Highlands has to offer,” Hammond added. Anyone interested in applying for an internship for next summer should check The Alleghany Foundation’s website in December and January and/or look for an ad in the Virginian Review. In addition, pending national grant funding, anyone interested in community service should contact the foundation if you might be interested in becoming an AmeriCorps service member this fall. Reprinted with permission from the Virginian Review. This Story appeared in the August 2, 2018, edition of the newspaper.